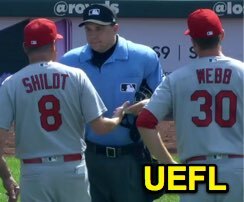 HP Umpire Adam Hamari ejected Cardinals pitcher Tyler Webb (throwing at Royals batter Jorge Bonifacio; QOCU) in the bottom of the 9th inning of the Cardinals-Royals game. With two out and none on, Bonifacio took a 1-2 fastball from Webb for a hit-by-pitch. Replays indicate the pitch was located inside and hit Bonifacio's shoulder, having followed a prior pitch during the at-bat similarly thrown inside, the fifth such hit batsman of the game, the call was irrecusable. At the time of the ejection, the Cardinals were leading, 8-2. The Cardinals ultimately won the contest, 8-2. This is Adam Hamari (78)'s fourth ejection of 2018. Adam Hamari now has -1 points in the UEFL Standings (-3 Prev + 2 MLB + 0 Irrecusable Call = -1). Crew Chief Tom Hallion now has -8 points in Crew Division (-9 Previous + 1 Irrecusable Call = -8). This is the 118th ejection report of the 2018 MLB regular season. This is the 57th player ejection of 2018. Prior to ejeciton, Webb's line was 0.2 IP, 2 SO, HBP. This is St. Louis' 2nd ejection of 2018, T-4th in the NL Central (CHC 7; MIL 4; CIN 3; PIT, STL 2). This is Tyler Webb's first career MLB ejection. This is Adam Hamari's 4th ejection of 2018, 1st since August 11 (Danny Duffy; QOC = * [Check Swing]).